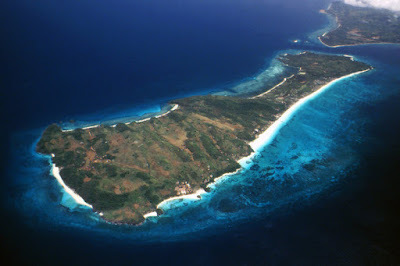 The jet's wings dipped and then I saw it: a tiny island with long white beaches and beautiful turquoise waters. It was Boracay, finally. The plane deposited us unceremoniously on the tarmac, and after grabbing my bag out of the scrum I walked off the runway and onto the street. It was the smallest airport ever. After paying for my boat ticket and tricycle ticket, I knew I was set. The tricycle dumped me off at the ferry dock, but I couldn't board yet. Apparently I hadn't paid for the dock fee. After getting that ticket, I was denied again. Ahhh, the environmental impact fee hadn't been paid. I gave my 4 pieces of paper to the lady, and after proving the importance of her job by stamping each one, she tossed them into a bin and let me pass. Philippine bureaucracy at its finest. I jumped on the boat excitedly, I was here! The ride to the hotel is one of the most uninspiring routes in the world. Hundreds of sputtering, buzzing, smoke-belching tricycles crowd a narrow road, pushing and passing one another at every little opening. It is Asian traffic at its worst. I was dumped off on the street. "Frendz Hotel here." After paying the ridiculous tourist price for the ride, I walked down the little path. After a couple minutes, suddenly, the walls parted and I stepped out upon paradise. What hits you first is the sand. Many beaches claim to have "white sand", but few can truly back it up. I took off my sunglasses for a brief moment and was almost blinded. The sand was a true white, pure and unbroken to the water's edge. Green coconut palms flanked the perfect beach endlessly in both directions. A vast turquoise sea went out to the horizon. I took off my shoes and squiggled my toes in the sand. It was fine and powdery, like only a few places on earth. I instantly thought about those other 2 places I'd been that had true white sand: Whitehaven Beach in the Whitsundays and Zanzibar. This was on par, although of course no place on earth makes that squeaky sound you get at Whitehaven. But then, I looked around a bit more. There were mobs of Asian tourists walking around, banana boats cruising in the water, para-sailing speed boats, and a navy of sailboats awaiting tourists parked just offshore. A few minutes walk down the beach brought me resort after resort. Masseuses plaintively meowed "Massage Sir? ", an army of children and boys asked if I wanted a mango or sunglasses or a boat trip. Boracay was not a lost paradise. 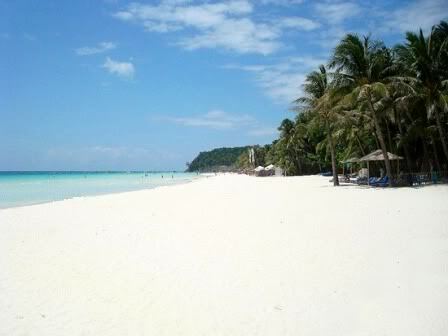 This was the legendary White Beach, and it was indeed worth being here. But I already wanted to escape to the other side, where dreams of wind and kiteboarding over clear water and corals awaited.